professionals to learn more about managing money. Services, at lstaylor@hirep.net or 515-282-8962. 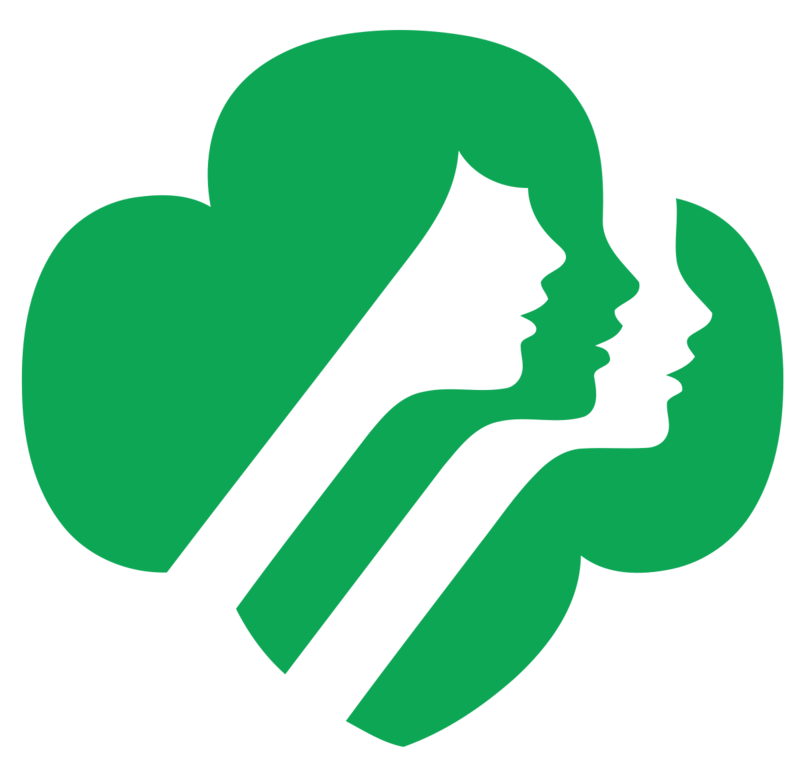 Space is limited to 60 scouts per session. 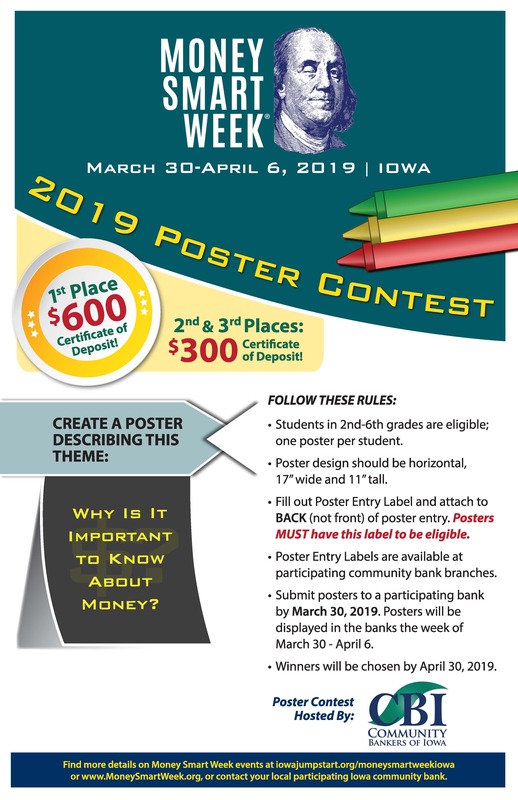 A fantastic part of Money Smart Week that is coming up in April is the Poster Contest sponsored by Community Bankers of Iowa. The contest is for 2nd-6th grade students. It is fun for the creative kids to try to make some money with their art. Please go to this website for all the details. 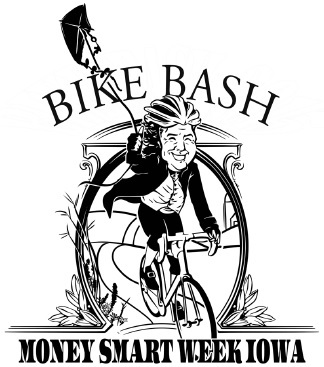 Join us for the 2018 Money Smart Week (MSW) BIKE BASH on Saturday, April 28, 2018, at 11 a.m. This family-friendly bike ride combines bicycling with financial literacy and offers a chance to win one of five $250 college savings plan deposit and other great prizes! The bike ride will begin at Mullets in downtown Des Moines at 11 a.m. Participants are encouraged to arrive early to play a financial literacy game to be entered for a chance to win a college savings plan deposit. Participants can also play the game and enter to win during the packet and T-Shirt pickup (details below). Route maps will be available prior to the event, at Mullets. Packet and T-Shirt Pickup will take place on Friday, April 27 from 4 to 6 p.m. at Bike World West in West Des Moines. The event is FREE, but registration is required. For more information, contest rules and to register, click here. The Iowa Council on Economic Education is facilitating two state finals events – the Iowa Personal Finance Challenge on April 10 at the Federal Reserve Bank in West Des Moines, and the Iowa Economics Challenge at the Iowa State University Extension office in Altoona on April 17. The Personal Finance Challenge will consist of student teams across Iowa creating presentations on how families can address and manage finances while facing financial adversity. A panel of judges will determine the state champion, runner up , and third place finishers. The Economics Challenge will consist of three multiple choice assessment rounds for advanced placement and traditional economics students. The top two teams in each division will then compete in a quiz bowl to determine the state champions. Last year was the first year of these events in Iowa and they were a great success. This year over 2,500 students throughout our state have participated in the preliminary round and the Iowa Council on Economic Education is excited to bring students from across the state to Des Moines for these championship events. Volunteers are needed to help judge the Personal Finance Challenge as well as administer and score the assessments in the Economics Challenge. If you are available and willing to help, please contact Bob Mantell at bob.mantell@tsinstitute.org. Money Smart Cache! is now open for high school teachers to use in the classroom. Money Smart Cache! is an online game students can play on any mobile device or computer. During the game, student maneuver Ben Franklin through 21st century financial hurdles and get him to the “portal” to answer the quiz questions correctly and help get him back to his own time period. Money Smart Cache! addresses seven basic topics that students should understand to be financially literate – credit scores, identity theft, car loans, student loans, debit vs. credit, paychecks and budgeting. To participate, teachers simply sign up to receive a code for their students to use. Students are able to play as many times as they wish, and teachers have access to a guidebook that provides teaching hints. To sign up, click here. Money Smart Cache! is open the entire month of April and includes a national prize of $250 for one winning student and $250 for his/her teacher. The Iowa Money Smart Kid essay contest deadline has been extended. Iowa students now have until Friday, March 23, 2018, to enter the essay contest sponsored by the Iowa Bankers Association. $300 award for five runner ups (5 awards) – NEW! Please write a brief newspaper article describing the potential devastating effects of a natural disaster (fire, flood, hurricane, etc.) on a family’s financial situation. Please select only one type of natural disaster for the focus of your article. Be sure to include tips and resources for readers to help prepare them for a potential future unexpected crisis. All essays must be 400 words or fewer and are due by March 23, 2018. Click here for the Money Smart Kid application. Each year, during Money Smart Week (MSW), the Iowa Bankers Association sponsors the Money Smart Kid Essay contest in partnership with the Federal Reserve Bank of Chicago. Essays for the 2018 Money Smart Kid Essay Contest are due Friday, March 16, 2018. One student will be named this year’s Money Smart Kid and will receive $1,000 to put toward their college education. To participate, students must be in grades 7-11 and must reside the Money Smart Week Iowa or Quad City region. To learn more about the MSW essay contest and to download the application, click here.